Our 7th Annual Lunch and Learn was held on Tuesday, May 6, 2014 at Sharon Heights Golf & Country Club in Menlo Park. Tickets sold out in a few weeks making this event our most successful to date! Our wonderful speaker Dr. Condoleezza Rice was interviewed by honorary board member Susan Ford Dorsey covering a number of topics. The long time friends provided motivation for all of us with engaging and thought-provoking conversation. In their welcome, Ambassadors Co-Presidents Suzanne Crandall and Rose Lanham shared a video about what it means to be an Ambassador for LPCH and shared the many volunteer opportunities and educational opportunities offered throughout the year. Thank you to all of you who made this event a success and supported LPCH with your ticket purchase. We were thrilled to see so many members of our community come together for this special event. In addition to the funds raised, over 300 classic children's books, serving as centerpieces above, were donated to the LPCH School following the luncheon. These books were generously donated by Bring Me a Book Foundation and the Koch family. 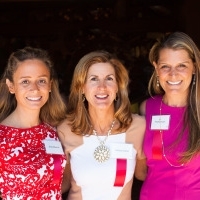 We are very appreciative of the efforts our event chairs Siliva Edwards, Melissa Kepner and Heather Koch (above) contributed to make this a wonderful event. Stay tuned for information from Ambassadors regarding next year's Lunch & Learn. senior executives of major companies to implement strategic plans and expand in emerging markets. Other partners include former National Security Advisor Stephen J. Hadley and former Secretary of Defense Robert M. Gates. Rice currently serves on the board of C3, an energy software company and Makena Capital, a private endowment firm. In addition, she is a member of the boards of the George W. Bush Institute, the Commonwealth Club, the Aspen Institute, and the Boys and Girls Clubs of America. Previously, Rice served on various additional boards, including: the Chevron Corporation; the Charles Schwab Corporation; the Transamerica Corporation; the Hewlett-Packard Company; the University of Notre Dame; the John F. Kennedy Center for the Performing Arts; and, the San Francisco Symphony Board of Governors.